Now this is embarrassing. Linda actually gave me grief because I chose to spotlight a “boring” (yes, that is the exact word she used) hawk in my last bird post (link here). I was quite stunned seeing as how I thought it was a pretty cool bird even if it isn’t so rare in these parts. It has a deadly beak, razor sharp talons and an extremely efficient killer. What’s so boring about a Red-Tailed Hawk? Her response – you need to feature something more “exotic” (again, her exact word). First of all, we live in Illinois – my options are pretty limited beyond our various wildlife vacations. Good thing she apparently missed my post with robins and sparrows (link here). 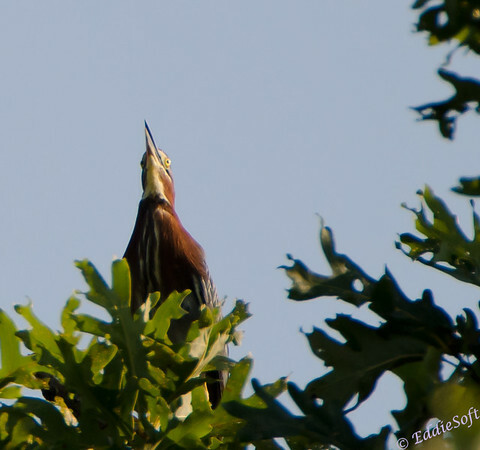 ….the Green Heron. This bird literally dropped in on us one day while we were out taking pictures in Jubilee Park. Actually, we were testing out some glass we rented from rentglass.com. We are considering upgrading our 200mm workhorse to a newer VR equipped version and wanted to see how it compared to our existing glass. There wasn’t much going on at the pond in terms of birds so I was off shooting dragonflies and anything else I could find that at least had wings. Linda was a ways back taking some shots of dirt or something (hoping for something to miraculously fly into the field of view hehehe). 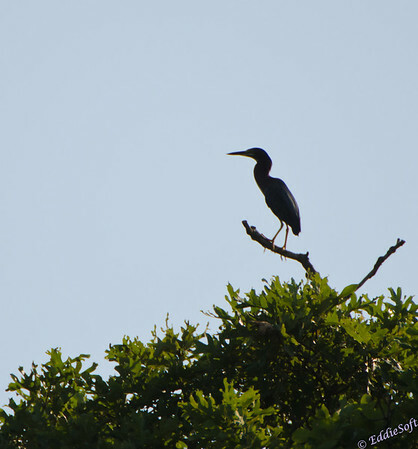 All of a sudden I see a large silhouette fly by on the other side of the pond and take up a position at the very top of some large trees overlooking the pond. 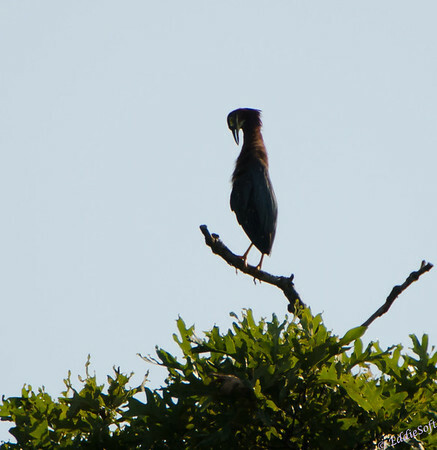 It was not apparent exactly what it was – looked kind of like a Blue Heron, but it looks like someone had squashed it and gave it a much thicker beak. Immediately I began trying to get Linda’s attention (since she was closer to it) without startling the bird. This was basically fruitless so made my way back to her. The bird was really to far for the 200mm so switched the teleconverter over to The Beast and went about trying to get as good a shot as possible which primarily consisted of trying to compensate for the backlight. In general, the shots are not as crisp as I would have liked, but I’ll give myself a break with the conditions – thankfully there’s the magic of post processing. Back at home it didn’t take long to identify the Heron – the benefit of NOT looking like a sparrow. This particular one is likely a juvenile since the coloring is still in the brown range where the adults sport the more green/blue hues on the head and wings. These birds are generally found in a family group or, as in this case, solitaire. According to the National Geographic Complete Birds of North America reference, this is one of the few NA birds that employ tools to hunt. They will place an item like a leaf or piece of bread on the surface of the water to lure fish into coming to the surface and thus right into their trap. Guessing they are just a few evolutionary years away from developing bow fishing. One thing I found extremely fascinating – a polite description for really being creeped out by it – was the eye placement. Looking from the side it looks fairly normal (reference first image). However, from directly below you can see the eyes actually appear to be sticking out from the side of the head. This must be handy when fishing since it can watch the kill zone without bending its head down to the water like the Blue Heron. For my loyal followers I risked thorns and swarms of mosquitoes to move in closer so you can witness this strange arrangement. Another feature of this bird is it will sit there and vibrate its neck in and out. This was having a bad effect on my shots since I was trying to shoot at a low shutter speed – this was changed once I figured out why the neck was always blurry. 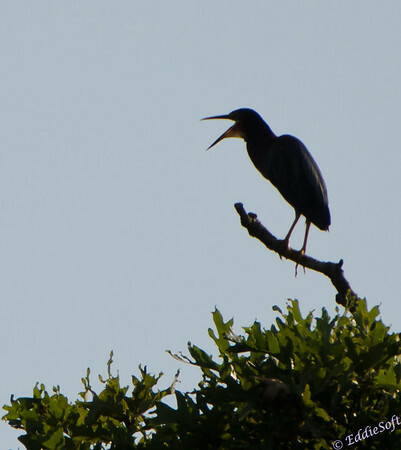 For the most part, the Heron remained very quiet. It just sat there and scanned the area from high above us. One thing for sure, the other common birds in the area kept their distance. A quick check of the reference manuals did indicate they are intolerant of other birds in their feeding areas. Looks like they have the same feeding characteristics as the Blue Heron which I am more familiar with, but at times they’ll feast on things like leeches and mice (more help from Wikipedia). I went ahead and threw in a few of the backlit silhouette shots to give you a good feel for their stature. From the shot below you can tell it has the same overall shape as the Blue Heron, but it is shorter and stockier – check out those toes! Remember when I mentioned that this bird was quiet for the most part? This was specifically noted because I was not prepared for when it did decide to let its presence be known. I have had the privilege to go on a number of shoots in the field and experienced a good share of bird behaviors and more to the point their variety of calls. Some are quiet melodious, some have quite the variety and others just plain annoying. NONE of them compared to the sound this bird made. All of a sudden, this bird opened up with a loud “SKEOW ” (Sibley spelling) that scared the crap out of me. Unbelievable. That’s it, just that one time but believe me it left an impression. Oh, here is another silhouette that was pretty interesting. For being so thick, that neck is actually pretty nimble. This particular pose looks more like a sock puppet than it does a real bird. 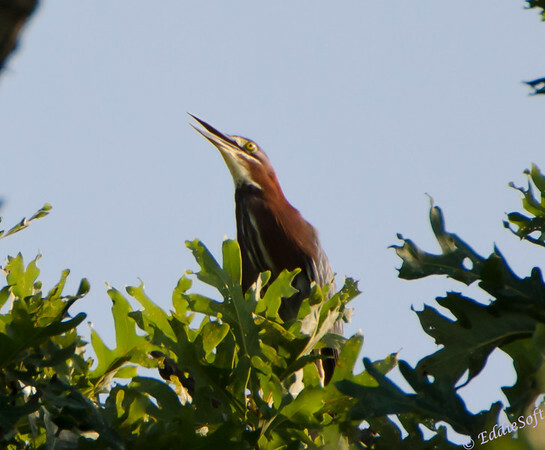 That about does it other than mentioning the Green Heron has Least Concern conservation status. Hoping this bird wasn’t too “boring” for everyone. The good news is we just got back from a shoot and now have at least three new birds to feature on upcoming posts – once post processing is done of course. Very nice shots. The first shot is iconic, and I was freaked out by the eyes in the second one before I even read your text about it. 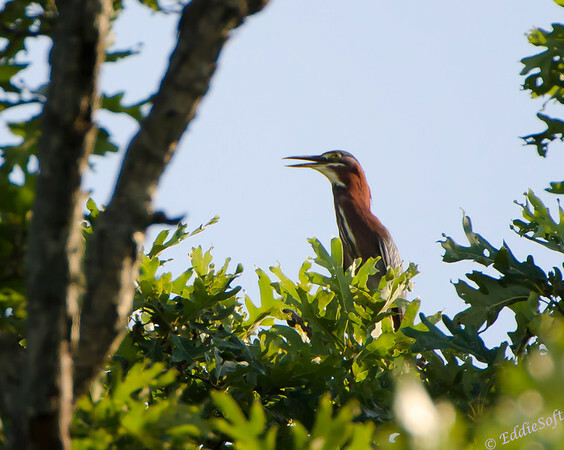 I have some photos of a Green Heron from many years ago at the Severson Dells forest preserve outside Rockford, but I didn’t have The Beast and so they aren’t comparable. 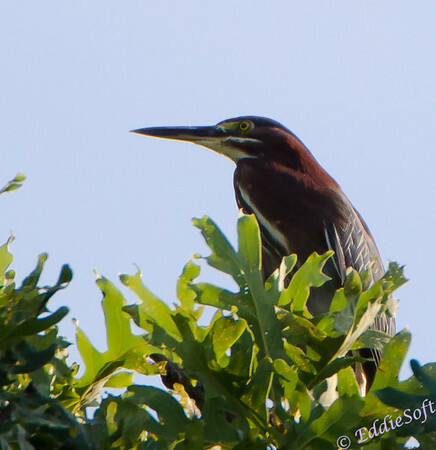 But I did learn what a Green Heron looks like. Pretty awesome for their size. I remember it’s body being a little thicker, but maybe that was because it wasn’t a juvenile. I don’t remember hearing the screech. BTW, I found the remark about photographing dirt or something to be quite funny. Excuse me…. purple ribbons??? Do you really think that an award winning artist such as myself would be photographing dirt? Brian can be so delusional sometimes. I just meant it was funny because it was absurd and made me laugh. I agree, the highly creative story really gave the hawk post that extra pop! Linda just doesn’t appreciate a good post when she sees one. This particular specimen was actually pretty thick in person – the Beast tends to flatten a little at distance but then again, they may hit the gym and bulk up a little as they transition into adulthood (don’t we all?). BTW I found your comment on my reference to dirt hilarious – in fact it was probably my enormous laughter that led her to promptly add her own comment to the post. Which brings me to responding to “a waving of the ribbons” which has been occurring waaaaay to often in my home. To have it done on my blog is just asking for me to once again point out it was not a purple ribbon for “Best Picture” but rather Picure – good lord how many times do I have to point that out or rather how many times is this false argument going to be used by my wife requiring me to point this same fact out over and over and over. I looked up the word delusional in the dictionary and it clearly states “She who refuses to accept that luck shots do not count in photography contests” There it is .. right there in black in white and everyone trusts Webster.